It’s often a struggle to get the drawing you see out of your head and onto the page. Several weeks ago I had one of those days. We drove out to the country looking for a sketching spot and found a promising site down by the river. As I looked up from the river bank I could see one of my favourite local shearing sheds higher up the hill. This is built in corrugated iron which has developed a lovely patina over the years. Behind it was a hill and the whole scene was enclosed below that skyline. I did make some quick pencil sketches before I started, but even so I struggled to get the proportions of the shed to the skyline accurately represented. I had taken along my watercolours to use for the first time in ages. I tried, but I had forgotten ‘in my hands’ how to use the paint. So I was unhappy with my result. Then I had another thought, to work back over one of my original thumbnails with the pencils I also took along. There was no pressure to get it ‘right’ I allowed myself to play with non-realistic colour and the drawing flowed! 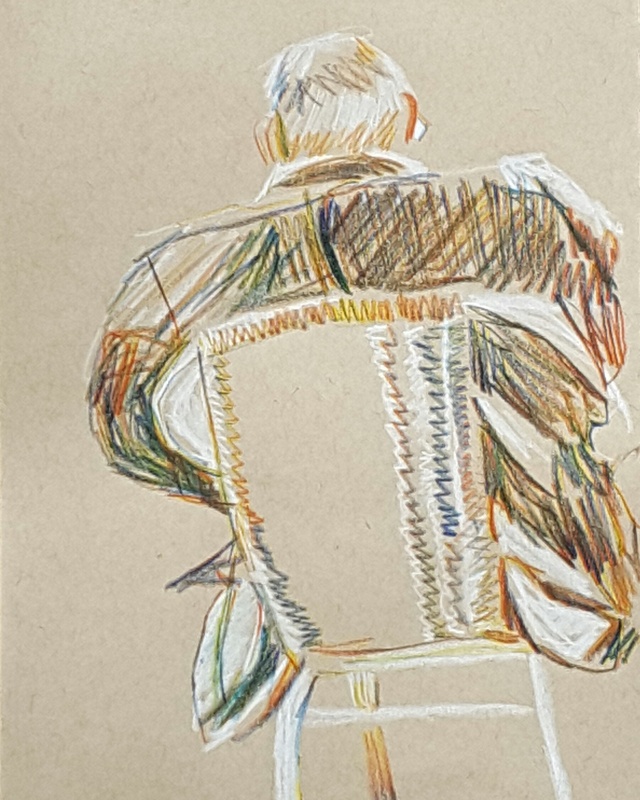 I’ve just finished working my way through my Strathmore Toned-Grey sketchbook, some 50 pages, most of which both back and front have been drawn on with coloured pencils. 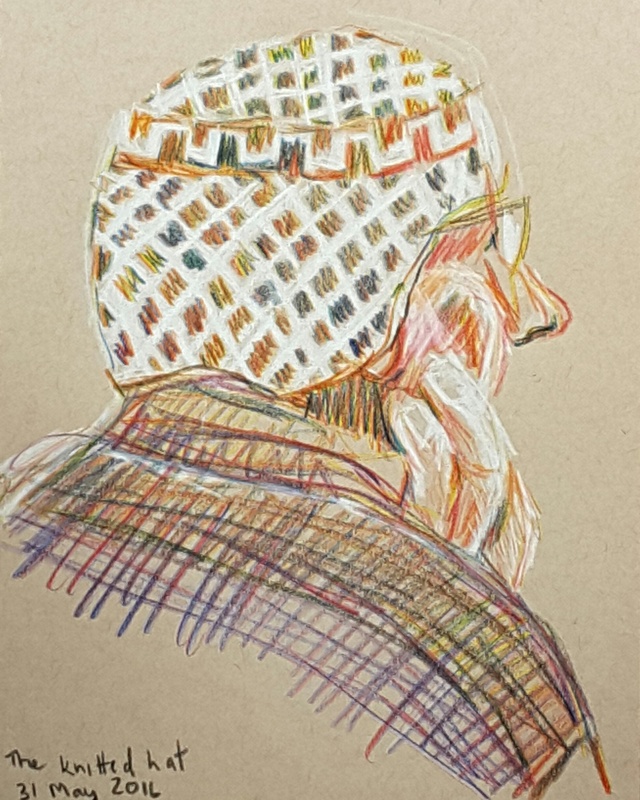 I’ve used coloured pencils since childhood, but as an adult I’m discovering these materials anew. Unlike watercolours it’s hard to satisfactorily mix new colours using pencils. I wished I had a range of more subtle colours on many occasions. So my recent pencil buys have been of greys and neutrals, colours which are not strongly represented in the pencil box. From left to right are: Green Ochre, Sandbar Brown, Slate Grey, 50% Cool Grey, 30% Cool Grey and 20% Cool Grey. On the right hand side of the pictures are the Sky Blue Light and White which I’ve been using for some time, but which fit also into this colour range. I’ve drawn them onto Strathmore Toned Tan paper below. I had started using them in my previous sketchbook but I don’t have any spare pages to show them on the Toned Grey paper. I already find these colours incredibly useful additions to my palette. Having now swapped to the Toned Tan sketchbook I’ll be interested to see how they go on the warmer background. And just because I can , I’ve forced myself to buy even more watercolours that I’ve seen written about by several artists whose work inspires me. All the colours are from the Daniel Smith company. These paints have been tried out on watercolour paper with a medium tooth. I love the granulation of the Lunar Black and I think the Buff Titanium is the sort of colour I’ve been after for some time. The Perylene green is for my partner who was after something dark for shadows in vegetation and the Mayan Blue is just because I like it. Same name but different location. Our local cafe has contracts for coffee shops at the university. Today, as we were in the area, we decided to try one of these venues. It was a completely different atmosphere and demographic from our nearby place, which is a ‘hole in the wall’ with a few outdoor tables. This other version was crammed full of students, with obligatory laptops, in the still under construction, College of Business and Economics. It is a lively scene that I plan to go back to again.